WI-FI IS KILLING AMERICAN TREES???????????????? JOPLIN, MISSOURI – Wi-Fi systems are killing trees across America. There may be no way to reverse the damage. A study by Washington University in St. Louis confirms that Wi-Fi radiation causes abnormalities in trees and these abnormalities eventually lead to tree death. Trees that are exposed to the RF (Radio Frequency) technology of Wi-Fi systems are dead within a year of exposure.The city of Joplin commissioned the study five months ago. They wanted to figure out why their city’s trees were developing weird growths, according to PC World. The study, conducted by Nobel Prize winning Professor Gunnar Hofverberg – the leading Wi-Fi expert in the United States, and a world-renown arborist. Hofverberg concluded that 95 percent of trees in urban areas will die from Wi-Fi exposure. “We studied tree bark, tree sap, and the various insects that inhabit trees. They were all adversely affected by RF. Botanists and arborists are extremely concerned and feel that this is a national crisis of epic proportions.” Hofverberg recommends banning all Wi-Fi usage within a ten miles radius of any trees. Additionally, on the west coast, excessive Wi-Fi usage is causing forest fires.“This seems to match our study,” said Hofverberg. He also feels that Wi-Fi usage may cause hurricanes and definitely contributes significantly to global warming. Hofverberg, who will be living in an ash tree for the next month, will be beginning a study on shrubs in a month. “Big shrubs.” He’ll have results in ninety days. WWN will, of course, follow-up. Do Wi-Fi signals kill trees? It’s an Internet rumor that is spreading, appropriately enough, like wildfire: Wi-Fi signals can make trees and other plants sick, causing cracks in their bark and killing off portions of their leaves. The outlandish claim, supposedly based on a Dutch study, cropped up late last week and has since been repeated in countless blog posts. In response, the Dutch government’s Antenna Agency, which provides information on the health effects of electromagnetic fields, has issued a statement urging caution on the unpublished, unverified and otherwise very preliminary findings. As rendered via Google Translate, the Antenna Agency wrote (with a few [sics]): “Based on the information nowavailable can not be concluded that the WiFi radio signals leads to damage to trees or other plants.” Wi-Fi signals wirelessly connect computers and other devices to the Internet. The radio signals are similar to that employed by other, decades-old technologies such as television and cell phones, said Marvin Ziskin, a professor of radiology and medical physics at Temple University. “Stuff like this has been around a long time . . . there’s nothing new about Wi-Fi emissions,” said Ziskin. “Scientifically there’s no evidence to support that these signals are a cause for concern.” Nevertheless, officials in the Dutch municipality of Alphen aan den Rijn tasked a researcher at Wageningen University several years ago to investigate unexplained abnormalities on local trees. According to a writeup on the municipality’s website, the work was apparently commissioned with an eye toward the increasing number of sources of electromagnetic radiation in the region, such as cell phone tower masts. In lab tests, leaves placed for a few months near six radiation sources emitting radio waves in the 2.4 gigahertz range common for Wi-Fi and other wireless communications became discolored and showed a “metallic luster appearance . . . followed by desiccation and death of a portion of the leaf,” the website said. Other reports have said that corn cobs exposed to such conditions grew more slowly than expected. TEMPLE TERRACE — A University of South Florida molecular biologist died Monday night in an apparent suicide by cyanide at a Temple Terrace hotel, police said. The discovery of the toxic substance also prompted evacuation of 75 to 100 guests at the Extended Stay America hotel on Morris Bridge Road, where Chauhan had taken a room. Chauhan was a post-doctoral researcher in the Global Health department in the College of Public Health. She has a 3-year-old child with her husband, Bharath Balu, who is also a researcher in the department. A note was found at the scene. Police did not disclose the contents. According to a medical examiner’s report, Chauhan had made prior attempts. Police got two 911 calls Monday night. One came from Chauhan’s husband, who said she called home to tell him she had taken cyanide, the report stated. Another call came after Chauhan stumbled out of her hotel room and told a couple in the hall. Paramedics rushed her to a hospital, but it was too late. When ingested or inhaled, cyanide quickly deprives cells of oxygen, according to the Centers for Disease Control and Prevention. “It’s not a safe substance, so it’s not an easy thing to come by,” said Cynthia Lewis-Younger, director of the Florida Poison Information Center in Tampa. Chauhan’s husband told police that his wife would have access to cyanide at work, according to the medical examiner’s report. No one else was harmed by the cyanide, police said. 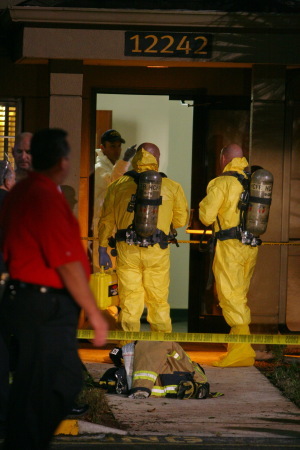 On Tuesday, a biotech company did an environmental cleanup at the hotel, and it reopened. USF officials released a statement saying they were saddened to learn of Chauhan’s death. The university plans to notify the community of public memorial services. She earned her doctorate from the Institute of Genomics and Integrative Biology in New Delhi, India, in 2005, then studied mosquitoes and disease transmission at the University of Notre Dame. Times] Fire rescue and hazmat crews work at an Extended Stay America hotel in Temple Terrace after Monday’s evacuation. Times news researcher John Martin contributed to this report. Jessica Vander Velde can be reached at jvandervelde@sptimes.com or (813) 226-3433. Many invasive species in Florida put pressure on environment, but humans may be increasing the effect. This morning I read a disturbing press release from the Science and Development Network (http://www.scidev.org/en/). The article described an experiment conducted on Grand Cayman Island where large numbers of genetically modified (GM) male Aedes aegypti mosquitoes were released into the wild. The Aedes aegypti carries dengue fever, a viral illness endemic to the Caribbean, South America, and other tropical areas. Scientists have been trying to eradicate dengue fever for years, with limited success. This report was disturbing because the first release of GM mosquitoes anywhere in the world occurred in 2009 and the global community was not notified until October 2010! Several issues surrounding this experiment are alarming. First, that a flighted GM organism was released into an uncontrolled environment. These mosquitoes can never be retrieved. Second, there was limited regulatory oversight of this experiment. The Cayman Islands have no biosafety regulations governing GM organisms, which is probably why the islands were selected as a release site. Third, there seems to have been little consideration of unintended consequences resulting from the release. The investigators assumed that using an island would prevent the GM mosquitoes from leaving the Caymans, yet mosquitoes reached Hawaii unintentionally via ship. There is no way to prevent these GM mosquitoes from reaching other islands or the continental U.S. via ships or planes. Finally, and most distressing, was the near total lack of international scientific publicity surrounding this trial! The research director indicated that he did not want to publicize the trial until the results were known. The company sponsoring the experiment, Oxitec, has declared the trial a success. What would have happened if it had failed or caused unexpected disease or environmental damage? Would Oxitec have publicized failure? This may seem academic, since we do not live in the Cayman Islands or tropical developing world, but there is dengue fever in Florida. Oxitec is already awaiting U.S. approval to release GM mosquitoes but the press release did not indicate the location of the proposed release. The Lower Keys would be a likely location. Federal regulations governing this type of research are much more stringent than those in the Caymans, but GM mosquitoes could be coming to South Florida. What will the consequences be? The trial of the OX513A strain of the dengue-carrying Aedes aegypti mosquito, developed by UK biotechnology company Oxitec, was carried out on Grand Cayman island by the Cayman Islands’ Mosquito Research and Control Unit (MRCU) in 2009, followed by a bigger release between May and October this year. Together they represent the first known release of GM mosquitoes anywhere in the world. Unpublished results of the trials, showing that the GM male mosquitoes competed with wild males, were presented at the American Society of Tropical Medicine and Hygiene annual meeting in the United States, last week (4 November). The male GM mosquitoes mate with normal females to produce larvae that die unless the antibiotic tetracycline is present. In tetracycline’s absence an enzyme accumulates to a toxic level, killing the larvae. The developers hope the strategy could be combined with other mosquito control methods to reduce transmission in dengue-prone areas. She described the lack of publicity surrounding the trials as “worrying, both from the scientific perspective as well as public participation perspective”. Steinbrecher said that until a full, long-term environmental assessment of the Cayman trials has been carried out, the recently announced Malaysian trials of the same strain should not go ahead. Angela Harris, senior researcher at MRCU, told SciDev.Net that her unit consulted with several Cayman Islands’ government departments beforehand. Luke Alphey, research director at Oxitec, said an extensive risk analysis was carried out and “we did lots of engagement work in Cayman, but no special effort either to spread the word internationally or not to [do so]”. On the sidelines of a press conference in London today he said that he had not wanted to publicise the trial until the results were known. He did not know what the Nagoya meeting was, he said. An environmental assessment of the trial site is now being carried out. Alphey said that the experiment complied with the Cartagena Protocol because prior informed consent was obtained from the Cayman government. Kathy Jo Wetter, a researcher with the ETC Group (Action Group on Erosion, Technology and Cooperation), a Canada-based organisation that promotes the socially responsible development of technologies, said ETC was unaware of the release. “Oxitec considers its trial ‘successful’ just days after the experiment has ended,” she said. “But unintended impacts on the environment cannot be known, and Oxitec’s unproven technology could make things worse in the long term. There is no possibility of recall if something goes wrong — who takes responsibility in that case?” “Extreme techno-fixes require extreme precaution,” she added. Alphey said they are waiting for approval for the release of GM mosquitoes in Brazil, Panama and the United States. Dr Lim Thuang Seng, an immunologist appeals to the government to seriously reconsider their intention to release genetically modified mosquitoes in Pahang and Malacca. Dr Lim said this experiment will not lead to any solution in eliminating the aedes aegypti mosquitoes in Malaysia, but to put Malaysian in unnecessary potential health risks. Dr Lim said although there was unofficial claim that experimental study on GM mosquitoes releases in Cayman island to eliminate aedes aegypti was a success, Dr Lim however, doubted how long the island will remain aedes aegypti free without continuous release of these male GM mosquitoes since the company that developed this GM mosquito claimed the male GM mosquitoes will die within a few days. Dr Lim also described the experiences of Cayman Islands in combatting the dengue transmitting aedes aegypti mosquito. Cayman Islands, a British Overseas Territory in the Caribbean, started its mosquitoes elimination efforts way back in early 1950’s using the then still approved method of 5 percent DDT. Success was achieved and subsequence surveys confirmed the Grand Cayman Islands was free of aedes aegypti. In 1965 with the objective of promoting tourism, Cayman undertook another campaign to control the Grand Cayman Islands’ nuisance mosquitoes including the dengue transmitting aedes aegypti mosquitoes. In 1966, the Mosquito Research and Control Unit (MRCU) established a network of ovipots and CO2 baited traps on the Grand Cayman Islands to detect and monitor the presence of aedes aegypti. No aedes aegypti were detected but subsequence surveys found presence of the mosquitoes in two other sister islands. Successes were achieved despite reintroduction of the mosquitoes in 1973, 1980 and early 1990’s. However, these re-emerged mosquitoes were subsequently eliminated. Today, Cayman Islands continues to face the threat of dengue transmitting aedes aegypti mosquitoes with evidence of aedes albopictus becoming established in some cities where aedes aegypti was eliminated. Dr Lim said, from the Cayman Islands experiences in combatting aedes mosquitoes, he believed the traditional methods of controlling mosquitoes used presently by the Health Ministry are effective enough if practised in combination and implemented persistently. Dr Lim explained that the Grand Cayman Islands with a land area of 200 sq km and surrounded by sea though effective in eliminating aedes aegypti, failed to prevent reintroduction of the mosquito from external sources. How can peninsula Malaysia with a much bigger land area and border with tropical Thailand in the north and Singapore in the south with close proximity Indonesia in the west, prevent the reintroduction of the mosquitoes? Dr Lim further explained dengue fever is transmitted by aedes aegypti and aedes albopictus and the Cayman Islands’ experiences indicated when aedes aegypti is eliminated in one area, the possibility of the area being taken over by aedes albopictus cannot be ruled out even though albopictus is predominantly found in forest areas. Dr Lim said genetic modification of mosquito genome has been going on for more than a decade, and it had raised concern from the scientific community as well as the public. The issue we Malaysians face today is not about whether the male GM aegypti will mate in the wild and produces non-viable progeny, it is also not about how long the GM mosquitoes will survive in natural environment, but more about the existing unpredictable consequences of mutation of these GM mosquitoes which according to the company that developed it, suggested it requires the continuous release in enormously large number of these GM mosquitoes into our environment in order to be effective in eliminating the aegypti mosquitoes in Malaysia. Given our geographical and environmental setting as a tropical country with half a year of heavy rain fall, the GM mosquitoes’ mission is destined to fail. Recent reports on the emergence of two new malaria-transmitting mosquitoes with similar physical but different genetically from the normal African anopheles gambiae also suggested the GM aedes aegypti may require genetic adjustment should similar mutation occur in aedes mosquitoes and that the abundant usage of tetracycline especially in animal farming industry may render the lethal tetracycline gene in GM mosquitoes ineffective faster than we thought. It is not known what would happen when we release a large number of GM mosquitoes into the environment, whether all the GM mosquitoes will die as planned, or will a few manage to survive and multiply. Are we absolutely certain that all larva or pupa will not develop into adult mosquitoes and will the GM mosquitoes or their lava or pupa not mutate? With all these uncertainties, can we trust the company that they can recapture all the GM mosquitoes that were released into the wilderness? Dr Lim believes the potential danger to Malaysian of a natural aedes mosquito mutating to overcome a new insecticide is far less than the potential danger of a GM mosquito that has received additional DNA and mutated. Finally Dr Lim hypothetically pointed out that assuming the GM mosquito is effective in eliminating all aegypti mosquitoes, dengue will continue to be transmitted but by aedes albopictus and in order to maintain the country aegypti free, continued release of GM mosquitoes is needed. In other word, the government will need to continue to spend a lot of money to keep the country free of aedes aegypti while cases of dengue continues to threaten the health of Malaysians. LONDON – Scientists have released genetically modified mosquitoes in an experiment to fight dengue fever in the Cayman Islands, British experts said Thursday. It is the first time genetically altered mosquitoes have been set loose in the wild, after years of laboratory experiments and hypothetical calculations. But while scientists believe the trial could lead to a breakthrough in stopping the disease, critics argue the mutant mosquitoes might wreak havoc on the environment. “This test in the Cayman Islands could be a big step forward,” said Andrew Read, a professor of biology and entomology at Pennsylvania State University, who was not involved in the project. “Anything that could selectively remove insects transmitting really nasty diseases would be very helpful,” he said. Dengue is a potentially fatal mosquito-borne disease that can cause fever, muscle and joint pain, and hemorrhagic bleeding. More than 2.5 billion people are at risk and the World Health Organization estimates there are at least 50 million cases every year. There is no treatment or vaccine. Unlike malaria, which is also spread by mosquitoes, dengue outbreaks are unpredictable and bed nets are of limited use because dengue-spreading mosquitoes also bite during the day. Researchers at Oxitec Limited, an Oxford-based company, created sterile male mosquitoes by manipulating the insects’ DNA. Scientists in the Cayman Islands released 3 million mutant male mosquitoes to mate with wild female mosquitoes of the same species. That meant they wouldn’t be able to produce any offspring, which would lower the population. Only female mosquitoes bite humans and spread diseases. From May to October, scientists released batches of genetically mutated male mosquitoes in cages three times a week in a 40-acre (16-hectare) area. By August, mosquito numbers in that region dropped by 80 percent compared with a neighboring area where no sterile male mosquitoes were released. Luke Alphey, Oxitec’s chief scientific officer, said with such a small area, it would have been very difficult to detect a drop in dengue cases. But their modeling estimates suggested an 80 percent reduction in mosquitoes should result in fewer dengue infections. For years, scientists have been working to create mutant mosquitoes to fight diseases like malaria and dengue, which they say could stop outbreaks before they start. But, others suspect it could be an environmental nightmare. “If we remove an insect like the mosquito from the ecosystem, we don’t know what the impact will be,” said Pete Riley, campaign director of GM Freeze, a British non-profit group that opposes genetic modification. He said mosquito larvae might be food for other species, which could starve if the larvae disappear. Or taking out adult mosquito predators might open up a slot for other insect species to slide in, potentially introducing new diseases. Humans have a patchy track record of interfering with natural ecosystems, Riley said. In the past, such interventions have led to the overpopulation of species including rabbits and deer. “Nature often does just fine controlling its problems until we come along and blunder into it.” Oxitec’s Alphey said their genetically modified mosquitoes can’t permanently change the ecosystem because they only last for a generation. But to stamp out dengue in endemic areas like Asia and South America, billions of the special-order mosquitoes would likely be needed to stifle their wild counterparts. Yeya Toure, who leads the World Health Organization’s team on Innovative Vector Control Interventions, called the Cayman Islands trial promising and said it’s worth continuing the genetic modification experiments. He said genetically altered mosquitoes aren’t meant to replace existing tools like insecticides, but to compensate for their limitations, like when mosquitoes develop resistance. Read said creating mutated mosquitoes might actually be the least invasive way to control dengue. By keeping a lid on the mosquito population via genetic modification, Read said entire ecosystems would be spared the toxic effects of indiscriminately spraying pesticides. He said the bigger problem would be selling the idea of genetically altered mosquitoes to the public. In the Cayman Islands, officials said they worked closely with the local community and encountered surprisingly little resistance.